I’ll admit it…I don’t understand shopping, especially when considering what is actually being offered in the majority of stores. It’s always hard for me to be in a place of mass consumerism (like NYC) as I see so many amazing people that don’t really need anything material spending thousands of dollars on stuff that just requires them to work more to pay for it. And then everyone is stressed from working so hard. The model our economy is based on promotes a continuous cycle of work to spend which also lends itself to work harder to spend more. But how much does anyone really get for all that spending? I heard a staggering statistic recently that the average American in his or her life time consumes the equivalent of 14 generations worth of the Earth’s resources. Sadly, I believe it…alongside the statistic that the average American makes about 4 lbs of trash a day. We can’t keep consuming at this rate and the truth is, we don’t need to, we have just been conditioned to by a system with advertising that is fueled to make us feel in need. 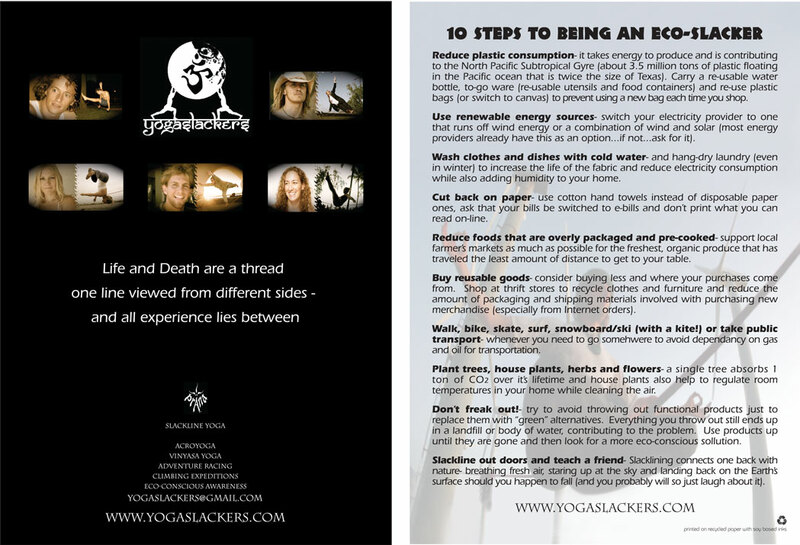 Thankfully, the YogaSlackers have been setting trends in our minimalistic lifestyle of thriftiness and spending as little as possible. Here’s our top 10 list for those on a budget and guess what, the choices are also good for the environment… coincidence? not really… the less you consume the more everyone benefits, especially the planet….ok, we’ll allow you to buy a slackline for #10 on the list…especially if it’s one of ours.